What kind of programs to organizations have in place to manage vendor risk? In far too many instances, protections against cyber breaches remain woefully inadequate. A primary source of weakness is your company’s community of vendors and other “trusted” partners that often have privileged access to your data, systems, and networks. If a vendor’s own security practices are inadequate, or if its employees are negligent or ill-intentioned, your company’s sensitive data can be placed at significant risk. 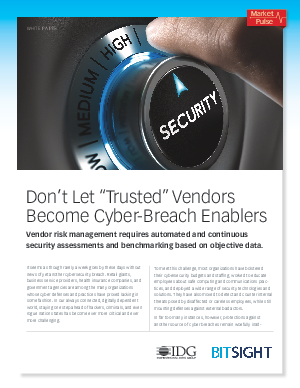 Vendor risk management requires automated and continuous security assessments and benchmarking based on objective data. How to move beyond "point-in-time" tools and begin continuously monitoring your vendors.